This article is about the baseball team. For the electric utility serving southeast West Virginia from 1986 to 1999, see Allegheny Energy. The West Virginia Power is a Minor League Baseball team of the South Atlantic League and the Class A affiliate of the Seattle Mariners. They are located in Charleston, West Virginia, and play their home games at Appalachian Power Park which opened in 2005 and seats 4,500 fans. The history of professional baseball in Charleston, dates back to 1910, and a team known as the Charleston Statesmen of the long-forgotten Class D Virginia Valley League. In 1911, the Statesmen moved to the Class D Mountain State League, and then folded after that year. A new team, the Charleston Senators was formed in 1914 and lasted three seasons in the Class D Ohio State League. In 1931, a new Senators team joined the Class C Mid-Atlantic League as an affiliate of the Cincinnati Reds. This team lasted until 1943. In 1949, the Senators were reformed as a member of the Class A Central League. In 1952, the city was granted a franchise in the Triple-A American Association. At first, this team was affiliated with the Chicago White Sox, then the Detroit Tigers, and finally the Washington Senators. In 1958, the Charleston Senators won the American Association championship. The franchise ceased operations after the 1960 season. In 1961, the city had no team, but the Triple-A International League San Juan Marlins, affiliated with the St. Louis Cardinals, moved to the city in on May 19 when the team was deemed not financially viable. In 1962, the Charleston Indians, affiliated with the Cleveland Indians, moved to the city in the Class-A Eastern League, and in 1963 that league was elevated to Double-A. The team folded after the 1964 season. Baseball returned to the city in 1971 with the Charleston Charlies of the International League. The Charlies played in the International League from 1971 to 1983. The team was the relocated Columbus Jets. The Charlies were affiliated with the Pittsburgh Pirates, Houston Astros, Texas Rangers, and finally the Cleveland Indians. The team won the league championship in 1973 and 1977. The Charlies left for Maine following the 1983 season, and, after several moves, the team today is now known as the Scranton/Wilkes-Barre RailRiders. Today, the Power sell nostalgic "throwback" merchandise from the Pittsburgh-affiliated era of the Charlies, which is generally considered the pinnacle of the baseball in the city. In 1987, the city resumed minor league baseball after a three-year absence. The new team was first called the Charleston Wheelers, so named for the city's history of stern- and side-wheeled boats. The Wheelers began as a co-op team, with players from several Major League Baseball franchises including the Los Angeles Dodgers, Detroit Tigers, Chicago White Sox, Chicago Cubs, Philadelphia Phillies, and Atlanta Braves. In 1988, the franchise became the Chicago Cubs' third full-season Class A franchise (the other two being Peoria in the Midwest League and Winston-Salem in the Carolina League). The only two players on that 1988 squad to reach the Major Leagues were SS Alex Arias and C Matt Walbeck. The Wheelers won the Class A South Atlantic League championship in 1990, the only league title for the franchise. By that point, they had changed affiliation to the Cincinnati Reds. West Virginia is and will continue to be recognized as one of the leading energy providers for the country. The energy production from coal, natural gas, and hydro-electric sources, combined with the fact that Charleston serves as the center for the state's political and economic powers led us to the name of the team. We felt it was extremely important that the name reflect the entire region and are excited about the tremendous marketing opportunities that will go along with the name. The Power won the 2007 SAL Northern Division title, but lost in the league championship series to the Columbus Catfish in three-straight games. In 2019, the Power—now affiliated with the Seattle Mariners—announced a coaching staff of Dave Berg as manager, Alon Leichman as pitching coach, and Eric Farris as hitting coach. The Alley Cats and their predecessors played in Watt Powell Park in the Kanawha City neighborhood of Charleston. Seating approximately 4,500 fans, Watt Powell Park was bordered by MacCorkle Avenue on the front (north) side, 35th Street on the east, and South Park Road on the west. On the south side of the park, a ridge of hills formed a natural boundary. Fans who would otherwise have had to pay to see the games periodically watched the action from a CSX railroad line hard up against the south wall of the stadium. The Power now plays its home games in Appalachian Power Park at the east edge of downtown Charleston, a little more than a mile across the Kanawha River from the former site of Watt Powell Park. Most of the financing for the $25 million stadium came from the state, and the city, although the ownership team put up approximately $5 million. The original cost of the ballpark was supposed to be $20 million but cost overruns put the figure at $25 million. The city's share came mostly from the sale of Watt Powell Park to the nearby University of Charleston, which immediately sold two-thirds of the land to Charleston Area Medical Center, the region's largest hospital. Originally, the new park was to be completed for the 2004 season, but politically induced delays in securing state funds forced construction to be put off for a year. The new park opened in April 2005. 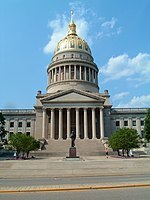 ^ "Personnel News: West Virginia, Pittsfield, Victoria". Ballpark Digest. February 1, 2019. Retrieved February 1, 2019.